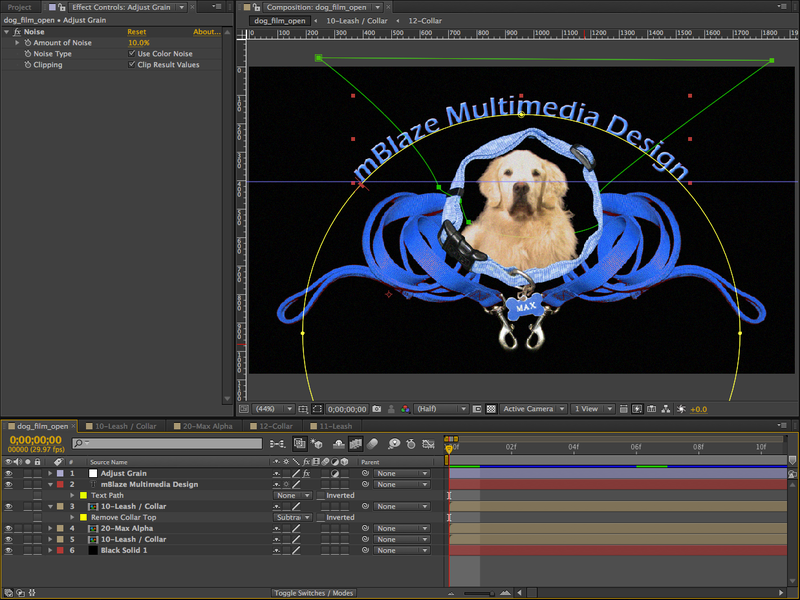 For the last three weeks we have been discussing creating an MGM-style film open in Adobe After Effects. In "Dissecting the Video: MGM-Style Film Open (Part 1)" we covered preparing the video element. Last week in "Dissecting the Video: MGM-Style Film Open (Part 2)", we covered the preparation of the photo elements. With all the elements prepared, we're ready for the next step. 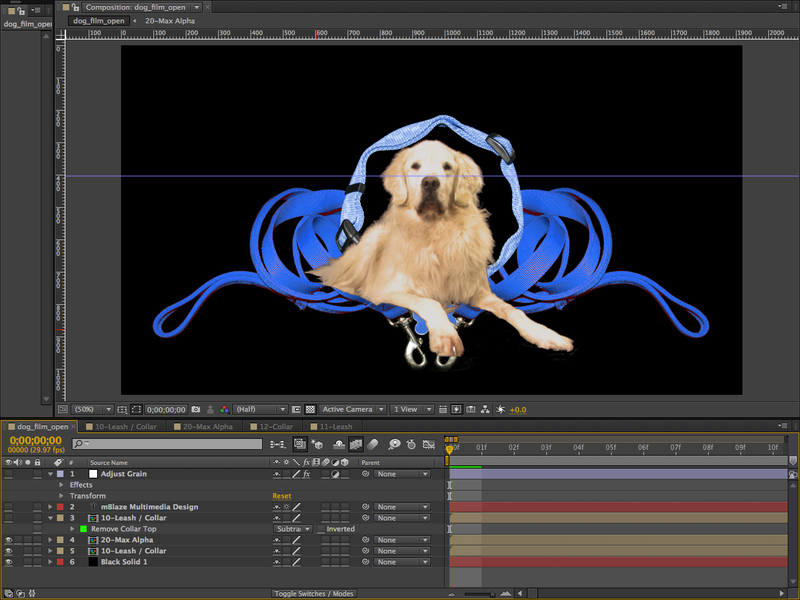 This week will wrap up the project by creating the final composite of Max the dog as the MGM lion in Adobe After Effects. Adjust Grain - The top layer is an adjustment layer that adds a subtle grain to the whole comp. This gives a hint of a film look and also blends the elements to look like they originated from the same stock. 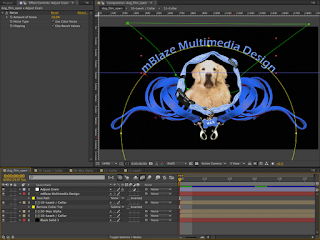 mBlaze Multimedia Design - This is a text layer of your company name that is applied to a path. The vertical guide assists in making sure that the text is placed correctly on the path. The text has a slight inner bevel to give it a little depth. 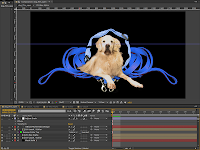 Leash / Collar - This is the comp that we created that contains the graphic elements of the leash and collar with their proper placement. This will cover the lower half of Max's body. This layer includes a mask called "Remove Collar Top", which does just that. It's a subtractive matte that removes any part of the collar that Max's face will move in front of. Max Alpha - This is the video of Max with the background removed. Max's lower half will be behind the leash and collar while his face sometimes moves in front of it. Leash / Collar - Another layer of the Leash / Collar comp. This lower layer will be the portion that is behind Max's head as he "roars". Black Solid - This will be the background color for the composite. Once all of the elements are together in the final composite, it's time to render. Choose your favorite video codec and render away. You now have a cool little film open for your next Hollywood-ish production. Below is the final version of Max mimicking the MGM lion. If you'd rather not go through the trouble of building this in Adobe After Effects (or you don't have an dog as talented as Max), a version of this open without the mBlaze text is available at Fotolia.